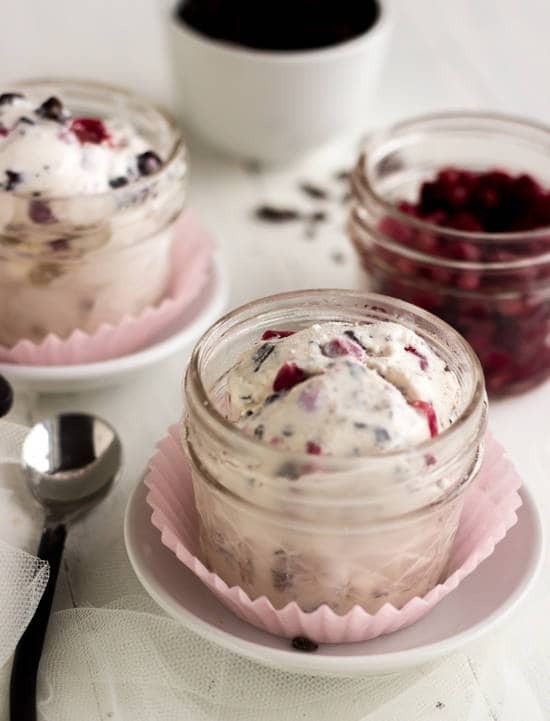 An easy, healthy ice cream recipe with pomegranate seeds and dark chocolate chunks. You’d never know this creamy ice cream is low fat! I’m going to get a little sappy on you. Just for a sec though, I promise. DON’T RUN AWAY! It’s almost Valentines day, and I love him, so it works. We are leaving on a weekend cruise to the Bahamas in 3 hours to celebrate our 1 year wedding anniversary so I am super excited with a side of sap and mush! Side note: His other Valentines day “idea” was chocolate covered strawberries. Because that has never been done before. You clearly see why I chose this one. Creativity is not generally a trait that the hubs possesses. See, I promised only sappy for a sec. Ok, like I just told you we are leaving for a cruise TODAY, like in a couple hours and I am SO excited! I have never been on one before and we wanted to go big or go home for our 1 year because it took A LOT of work to get ourselves married, and the past year has been crazy. I mean, all marriages have an element of crazy, but let me give you the super quick run down of me and Mr.FFF. I promisepromisepromise we will get to the food. Me and the hubs (his name is Caleb by the way, but I never call him that. You know this) met on a dating website called Christian Mingle. He lived in Nebraska and I lived in Vancouver, Canada. When he messaged me, I had no idea where Nebraska was (I thought NE stood for New England. Geography=not my friend.) and I honestly tried to make him stop messaging me as I figured it would never work. I mean, we lived in different countries. LONG LONG story short, he harassed me and I kinda fell in love with him (as much as you can fall in love with someone over Skype.) and he eventually flew to Canada to meet me. We both knew this was it and decided to figure out a way to make this thang real. After he went back to Nebraska, we spent 2 months apart and then I flew to Nebraska to meet his family. We ended up driving back to Canada ( a 3 day drive after really only having about 1 week of “real life” time together…talk about a relationship test!) and he moved in with my family in Canada, until he found a job in Washington state. I was lucky to live very close to the border. So, one day, I prayed that if he was the one that God wanted me to be with, he would get a job in the closest possible city to the border, so that we could see each other on a regular basis. Guess what? The ONLY job offer he got was from that city, and it was the very next day! I knew it was a done deal. We spent 5 months dating and having to cross customs 4 zillion times a week until we finally got engaged. The past year has been filled with lots of paperwork and stress in order for me to get my Green card, and it all ended with a super scary interview at the US Consulate. Top that off with moving for my very first time EVER, and it was a huge move (Vancouver, BC to Florida, USA.) Needless to say, it’s been crazy and we are stoked to relax, even just for a few days. I guess that was kind of long. Sorry. I get into it when I am talking about the huberoni. Yes, I call him that in real life. No, he does not like it. Ok. Ice cream. I know, there’s that thing called The Polar Vortex, or whatever, happening outside you window and the LAST thing that you want to do is eat ice cream. But, seriously guys, this is worth it! 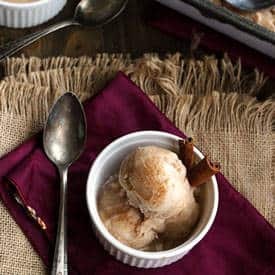 The base is just a classic vanilla BUT it is completely egg-free and way way WAY lower fat than your typical ice cream, but still has ALL the creaminess. 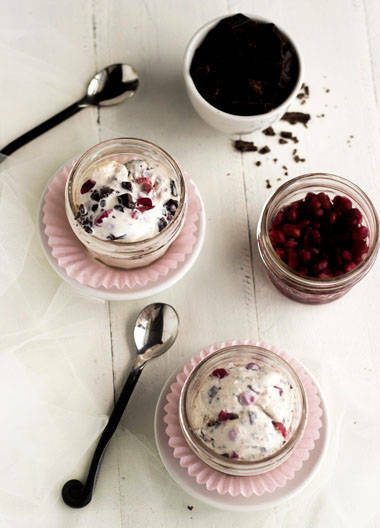 The dark chocolate and pomegranate seeds add the perfect sweetness, crunch, and “hi I’m pretty” factor that is worth bearing the cold for. I pinky swear with both pinkies AND my pinky toes. If all else fails, maybe it will push you over the edge into hypothermia and then you won’t even feel the cold. OK CRUISE TIME! See ya’ll Monday….and Monday is going to be a very exciting day indeed. 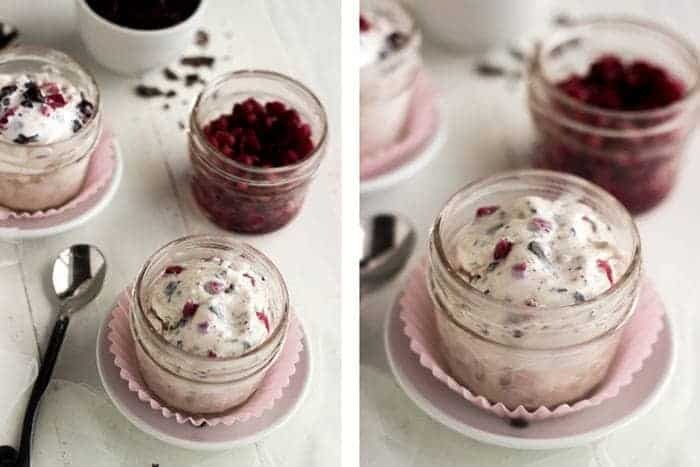 An easy, healthy ice cream recipe with pomegranate seeds and dark chocolate chunks. You'd never know this creamy ice cream is low fat! In alarge pot, combine the half and half, milk, sugar and salt and bring to a boil over medium heat. In a separate small bowl, whisk together the cornstarch and remaining milk until smooth and well combined. Take the pot off the heat and stir in the vanilla extract and vodka. Let cool to room temperature. In the final minutes of processing, add in the pomegranate seeds and chopped dark chocolate. Serve right away as soft serve or let the ice cream harden a bit in the freezer for an hour or two. * Don't omit this, it keeps the ice cream super creamy! 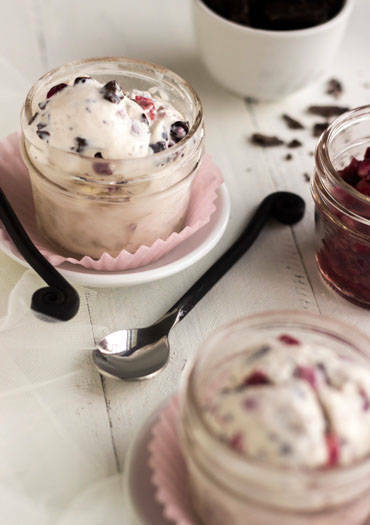 Want more Homemade ice cream? Oh boy!! This ice cream sounds dreamy! My head is spinning from all the moving – CONGRATS on yalls 1 year anniversary! After everything I dont blame yall for going all out in celebrating! This ice cream looks fab – even for us in frigid temps! Oh my gosh, I love this Taylor! What a sweet and romantic story of how you and your husband met. I feel like I know you even better now. And so sweet that he thought up this recipe. Don’t you love when your husband tries to help you think of recipes? The other day my husband was like, “you should do a recipe on my grilled steak!” It’s literally just steak, salt and pepper, haha! Oh men. But Caleb came up with a real winner, this ice-cream sounds delicious! Thanks Natalie! He is a pretty awesome guy, and that is too funny about your hubbies steak recipe! Such a sweet story Taylor! It makes my heart all warm and mushy inside. Love love. 😉 Have SO much fun on your cruise and make sure you try to unplug as much as possible!! 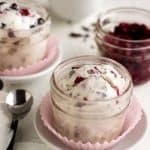 And your hubby must have some creativity in him, because this ice cream is ALL ABOUT cit, and how can you go wrong with pomegranates and dark chocolate? You just can’t. This ice cream turned out so great and it looks amazing! I love all those rich chunks throughout it! Have an awesome trip, Taylor! Our story had some pretty hefty long-distance elements to it, but nowhere close to what you two had going on. That cruise sounds wonderfully relaxing. 🙂 And this ice cream looks fantastic! Love the crunch from the pomegranate seeds (and the chocolate, of course). I’ve never mixed vodka into ice cream before, but I think that needs to change. Super glad I always keep the base of my ice cream maker in the freezer – ready at a moment’s notice! Long distance is the worst eh!? We had an amazing weekend though! Skinny and vanilla vodka- ’nuff said! This is something I totally wanna try, but maybe when it’s a little warmer outside! Have a lovely cruise!! You and your husband definitely deserve a weekend of relaxing and celebrating, especially after all of the craziness of dating by crossing customs and your Green card and moving. So happy for the two of you that you found each other! 🙂 And there’s nothing wrong with ice cream in the winter! (Although I live in California, so I’m probably allowed to say that…) It’s all I’ve been craving for the past 2 weeks, and your husband’s flavor sounds amazing! I hadn’t thought to use fat-free half and half, but that sounds like the perfect way to keep ice cream lighter. Definitely pinning this recipe too — you have so many good ones!! Awwwwwww! This is such a sweet post, my love. Have an amazing trip 🙂 And tell your Mr. this recipe idea is a total WIN! We LOVE pomegranates in our house, we can not wait to make this!! Wow this looks amazing Taylor! Icecream is my weakness. I just found your blog and I always love to meet another sister in Christ. Have a great weekend! How romantic. Now, that’s a love story! I hope you have an amazing time on your cruise. Let me know how you like it. This ice cream is amazing. Tell Mr. FFF I said good work. Pinned. Thanks girl! I told him 🙂 He was happy. What a wonderful post!! I don’ know which one I like more, the story or the ice-cream!! Also, this ice-cream looks phenomenal! Frozen anything in winter? Yup, I’m in! I’m not one to say no to this creamy goodness, especially if pomegranate is involved hehe. 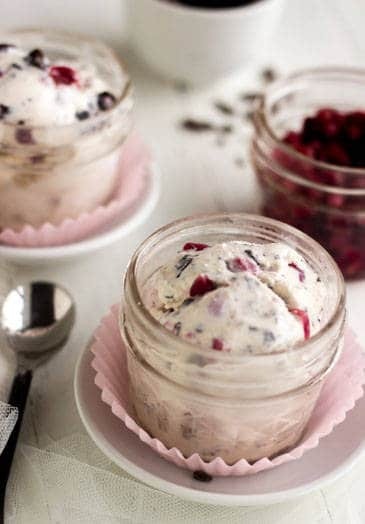 The pomegranate/chocolate ice cream sounds great. Now, vanilla vodka! that is a new one to me. Hi! I was just wondering, what kind of ice cream maker do you use? I’m looking to get one, but there are tons of options on Amazon. Cuisinart is usually a good choice, but there is a much cheaper one but some brand I’ve never heard of. So, unfortunately, I don’t use a stand-alone ice cream maker. I have the ice-cream attachment for my Kitchenaid Stand Mixer, which I LOVE!! I have heard great things about the cuisinart though. I think it would be better to spend a little more and get a good one, as I have heard terrible things about “no-name” ones. I hope this helps!